Walk through the 853-foot pedestrian tunnel connecting the mainland and terminal in six minutes or less. 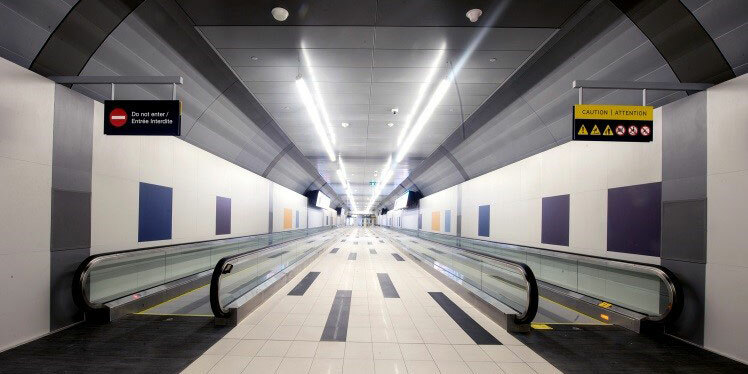 Billy Bishop Airport opened a pedestrian tunnel that connects Toronto’s mainland to the island, providing quick, reliable and easy access to the airport. If arriving from the mainland, the entrance to the tunnel is located inside the mainland pavilion directly to the east of the airport’s ferry terminal (see map) Six elevators are available to take you down the 100 feet to the tunnel level, which features four moving walkways for your added convenience. At the south end of the tunnel, you can choose to go up to the check-in area using one of the longest escalator systems in Canada, one of two elevators or a staircase of 153 steps to get to the top. The complete journey from the curb to the airport’s check-in area through the tunnel takes less than six minutes. The airport’s ferry will continue to operate as normal. For advertising opportunities in the mainland pavilion, tunnel or island atrium, please contact BLACK.